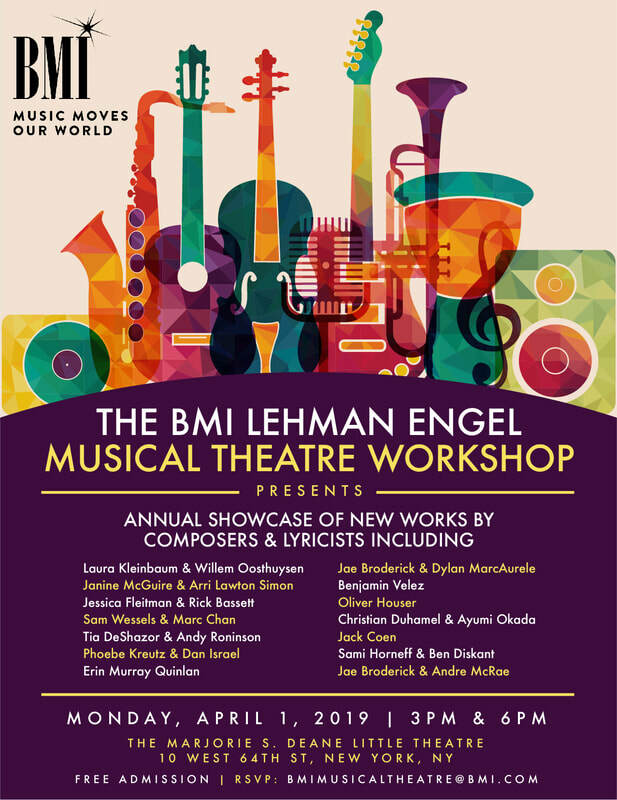 The BMI Lehman Engel Musical Theatre Workshop Showcase will present two new songs written by Jessica Fleitman and Rick Bassett, from their musical-in-progress THE AVERAGE-SIZED MERMAID. The songs will be performed by Christiana Cole and Aaron Phillips. There are two performances, April 1st at 3 pm and 6 pm. Tickets are free, but require a reservation. Click HERE for more info, and to RSVP. At the Marjorie S. Deane Little Theater, 10 W 64th St [between Lincoln Center Plaza and Central Park West at the West Side YMCA], New York, NY. A Little New Music, L.A. to present Fleitman and Bassett holiday song Dec. 20. A Fleitman and Bassett original holiday song will be part of the celebrations at this concert by A Little Night Music in Los Angeles, Dec. 20th. We're thrilled that ALNM has chosen to perform another of our songs! Details HERE and HERE ! A holiday song by Bill Nelson and Rick Bassett will be presented at Broadway’s Future Songbook Series. Broadway Actors Will Perform All-New Holiday Songs in a Free Concert presented by Arts and Artists of Tomorrow, in the Bruno Walter Auditorium at the New York Public Library for the Performing Arts at Lincoln Center (111 Amsterdam Avenue and 65th Street). Details in the Playbill announcement HERE ! A new song written by Jessica Fleitman and Rick Bassett will be presented at the BMI Musical Theatre Workshop Smoker, a bi-annual showcase of featured songs. Thursday, December 13 at 5PM, at the BMI Media Center, 7 World Trade Center, NYC. The performance is free to the public, reservations required. More info here, and RSVP by emailing at the link here. Fleitman & Bassett present at NY City Center's "The New Musicals of Tomorrow." ​Jessica Fleitman and Rick Bassett will present a song from their musical "The Average-Sized Mermaid" at New York City Center’s “Front & Center The Original Musicals of Tomorrow with Tom Kitt” Monday October 15, at 6:30 pm. Christiana Cole will perform. New York City Center, Barbara and David Zalaznick Studio, 130 West 56th Street, 5th Floor. All tickets $30. Tickets and more info available here! Last night, Jessica Fleitman and I won the 2018 Jerry Harrington Award for Outstanding Creative Achievement in Musical Theatre from The BMI Lehman Engel Musical Theatre Workshop! We are incredibly grateful to this workshop for providing a supportive community for collaborators to meet, learn, and develop new musical theatre. Looking forward to the next steps Jessica and I take in our collaboration! You can check out some of our songs: here. ​June 6th and 7th, 2018: Went to Boston to hear Sutton Foster perform several of my orchestrations with the amazing Boston Pops! Such a thrill to hear this top orchestra perform notes I had put on paper. Orchestrations on new Sutton Foster CD "Take Me To The World"
Sutton Foster's new CD "Take Me To The World" released June 1, featuring four songs I orchestrated, performed with the Ball State Symphony Orchestra. Please check out this beautiful recording! Available here, and in all the usual online locations. New Videos from "In The Works"
​Christiana Cole and Aaron Phillips sang with all the feelings when Jessica Fleitman and I presented songs from our new musical "The Average-Sized Mermaid" at the Duplex, NYC on March 25, 2018. Check out Christiana doing everything in this song! More songs on the Video tab. A new song to be performed at the BMI Smoker, March 8. A new song I wrote with Jessica Fleitman will be performed by Christiana Cole at the BMI Smoker, Thursday, March 8, 5PM at the BMI Media Center, 7 World Trade Center, NYC. The performance is free to the public, reservations required. More info here, and RSVP by emailing at the link here. A song Jessica Fleitman and I wrote for our musical-in-progress "The Average-Sized Mermaid" will be performed March 6 as part of the A Little New Music series in Los Angeles. LA friends, please check it out! More details here and here. Getting into the Halloween spirit, Bill Nelson and I wrote A Zombie Song, and made a recording of it with some amazing singers. Listen to it below! Click here for credits and more info. Put up three new recordings of songs that I wrote along with Jessica Fleitman. Brand new, full arrangements. Killer vocals by Christiana Cole and Arri Lawton Simon. Some funky guitar by Reed Robins. Listen by clicking song titles in the window below, or click here to go to our SoundCloud page. Thanks!